My mom used to make something she called “Chicago Beef” sandwiches when I was growing up. It was a chuck roast that was simmered in the crock pot all day. Then served over crusty Italian rolls with melted cheese on top. It was one of my favorite dinners! I’d forgotten all about it until I saw it featured on Diners, Drive-Ins, and Dives. Googled recipes and came up with a ton. Evidently, most people refer to it as “Italian Beef”. I suppose it’s also known as Chicago Beef because the place that “put it on the map”, Al’s Beef, is in Chicago. Whatever you want to call it, it’s a great sandwich! I knew I wanted to cook it in the dutch oven, and not the crock pot. While I love the crock pot, I think you get a better flavor from roasts from cooking in the oven. I’m sure it would be great prepared in a slow cooker, but I’d definitely deglaze the pan with the beef broth – then add that to the pot with the beef and peppers. If you’re worried about it being spicy because of the peppers – don’t be! Pepperocinis are very mild peppers. They just have a great, zippy flavor. I love the addition of these to the beef! Totally make the sandwich in my opinion. I used provolone cheese, but mozzarella would be wonderful too. It’s traditional to dunk the whole sandwich in the braising liquid before serving. But, I have “issues” with soggy bread. I think the sandwich has plenty of juiciness without any dunking. You could always serve a small dish of the jus on the side as well. I also topped my sandwich with some sliced banana peppers, just because I wanted a little extra crunch. They were a hit with everyone in the house, and an easy dinner that pretty much takes care of itself. Will definitely be on our menus in the future! In a heavy oven-safe pot or dutch oven, add 1-2 Tbsp olive oil. Over medium-high heat, add chuck roast. Add the roast and sear for 4 – 5 minutes, until nicely browned. Turn and sear the other side and then turn and sear the ends. This should take 4 -5 minutes for each side. Remove dutch oven from heat. Add beef broth, water, Italian seasoning, salt, and pepperoncini peppers. Stir to combine seasonings with liquid. Cover dutch oven and bake in preheated oven for 5-6 hours, or until meat is fork-tender and falling apart. Remove from oven and shred meat. Return to dutch oven. To assemble the sandwiches – Preheat oven to 400°F. On a large cookie sheet, toast deli rolls (butter is optional) for 5-10 minutes. Top toasted rolls with warm shredded beef & sliced provolone cheese. Return to oven 3-4 minutes, or until cheese is melted. Serve hot. I have soggy bread issues as well, unless it gets soggy from lots of butter. These look fantastic! Sounds delicious, I am definitely going to have to give it a try. This is an amazing recipe. I use hot pepper rings and top with hot California mix chopped. 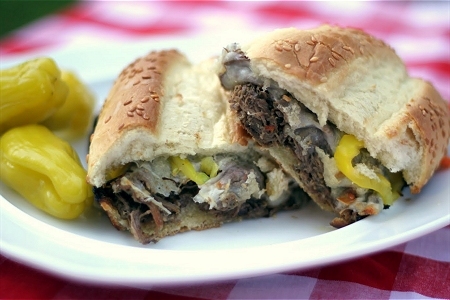 Part of the true Italian beef recipe is dunking the hole sandwich in the jus. It’s the real Chi town way to eat it. I definitely prefer mine not dipped due to the meat already being soggy.